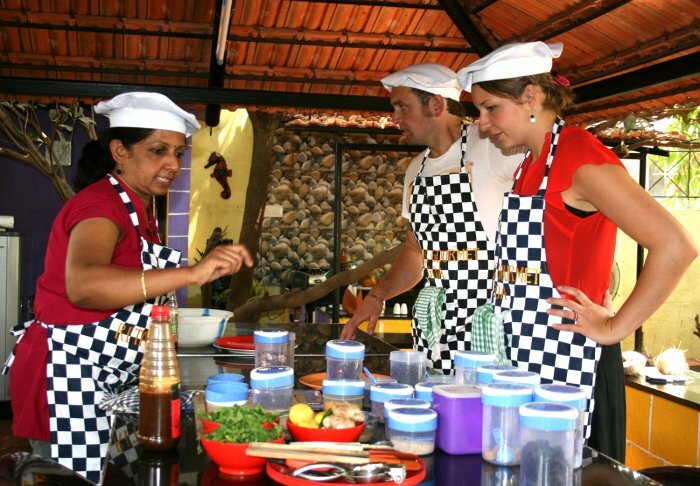 Situated at Dabolim (Goa), very close to Marmagoa Port (Goa), we offer Shore Culinary Tours for tourists arriving on Cruise Ships. 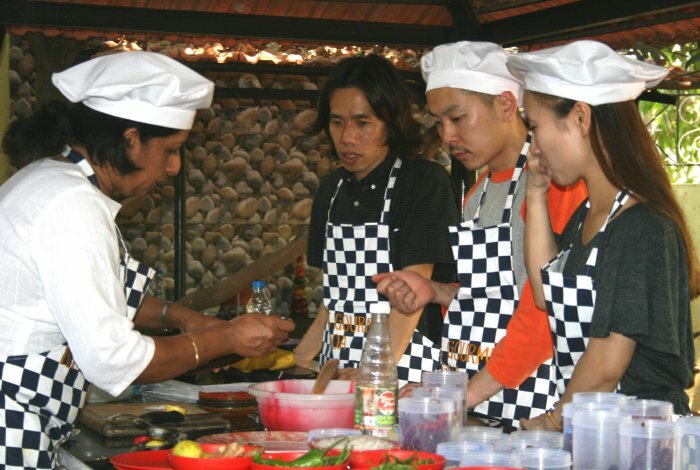 The tourists get an opportunity to explore the local farmer’s market, rich tastes, demonstration cooking, insight to culinary tradition and culture, all in this immersive culinary tour. Guided local farmer’s spice, fruit, vegetable market tour. Relishing traditional Indian breakfast / snacks. Demonstration in preparation of Masala Herbal Chai (Herbs & Spice Tea) & Black Cinnamon Coffee. 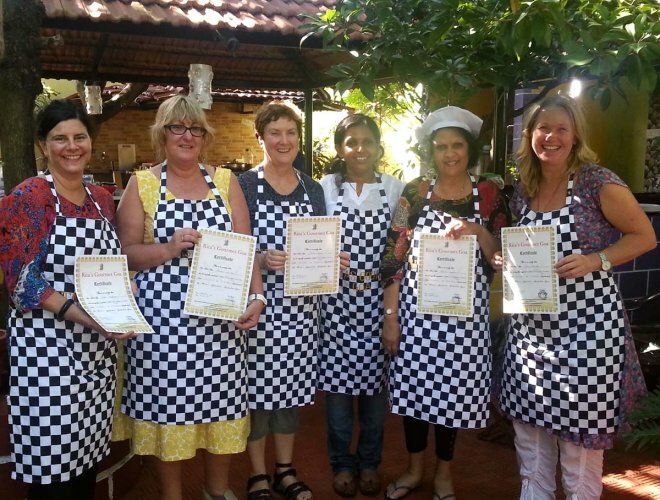 Demonstration cooking class in Goan delicacies. Knowledge bytes – Local traditions, culture and cuisine of Goa and how Port town derived its name after the famous Portuguese explorer Vasco da Gama. 09.45 am: Meeting Point- Cruise Pier (Harbour) Entrance gate where a representative of Rita’s Gourmet will stand with a Placard. The Pick up points are the Entrance Gate of Cruise Pier. The representative of Rita’s Gourmet Goa will stand at the Entrance Gate Meeting Point with a Placard displaying the names of the guest. Please call on (+91)7507452225 if you have any difficulty. Once you are at the Pick up point please call us on (+91)7507452225 to confirm. We conduct this tour if we have minimum four guests. Rs 4950/- (USD 75.00) per person. Payments to be made in INR. We have the facility of Credit Card Swipe. Many thanks Rita & staff for the market tour & cooking instruction. Brilliant day, wonderful quality food & insight into Goan culture. 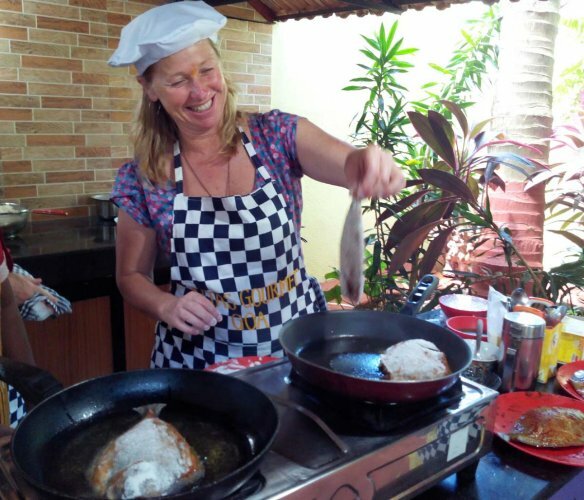 Rita is passionate about cooking which is reflected in her professional high quality classes. Would definitely recommend. How else do you get to spend a day in the home of a local, have a meal together, shop her local farmer’s market when you are in a foreign country and a strange city? Rita is the best. From her first responsive email to her transfer instructions off our cruise ship this week, she was professional, patient (with all my questions), kind and helpful. This is a woman who can cook! We enjoyed the welcome marsala chai she prepared in her beautiful courtyard commercial kitchen, covered from the hot sun and surrounded by her palms and gardens, explaining all the spices as they were freshly pounded. We then ate an authentic Indian hot breakfast, several sweet cakes (hubby loved having cake for breakfast!) and tasted some fruits we didn’t know. After a tour of her garden and home, we set to work chopping, stirring, cooking, baking, kneading, tasting…. then sat to eat a feast! Fish. Chicken. Curry. Vegetables. Rice. Hot shrimp appies. It was the best Indian food we have ever eaten served by the most gracious of hostesses. 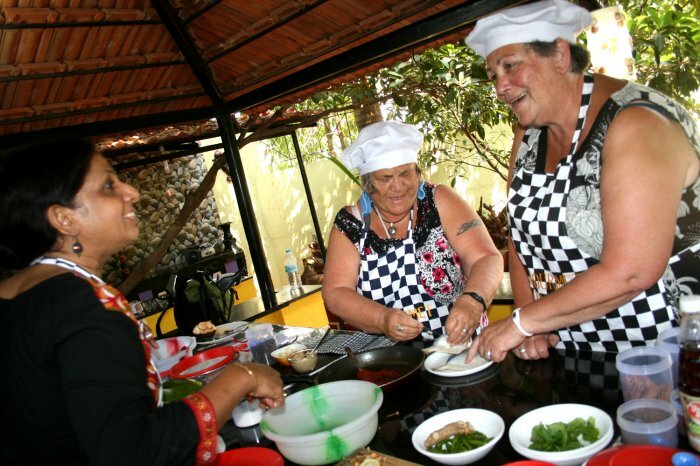 I can’t think of a better way to experience India, or Goa, then by spending a day with Rita who kindly answered all our questions and gave us a day where two worlds coincided. Way better than a day visiting yet another temple, mosque or tourist trap. It will be the day we will remember the best India has to offer! 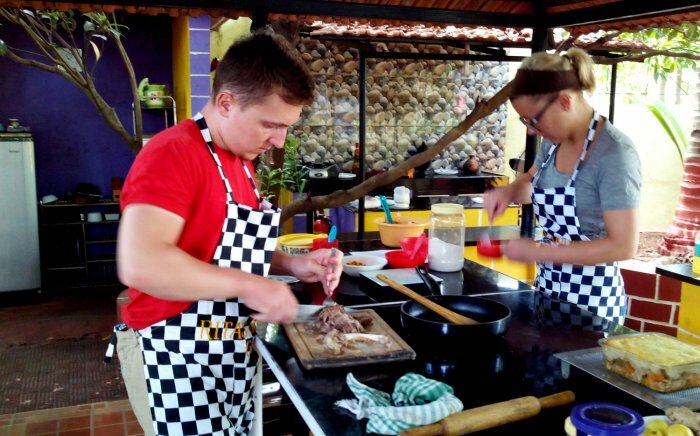 I like cooking and had a short day to spend, off a cruise ship in GOA. I thought Rita’s Gourmet would fit the bill. It WAS so much more. We went with two other people from the ship – and that was the class! Classes are small and hands on. Next we went to her outside cooking area. She had two assistants as well. 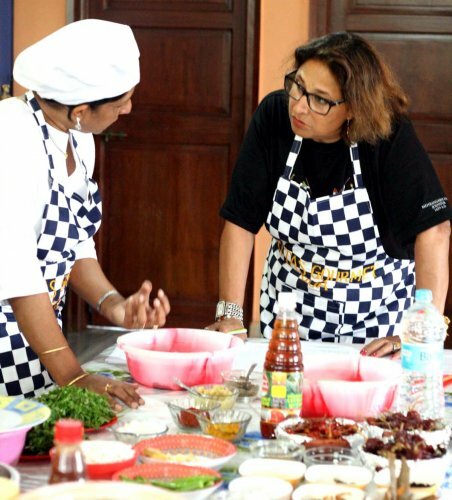 After reviewing the seasoning and spices that we would be working with, we learned about some of the differences between Goan and Indian dishes. We then started cooking. We made Prawns & Vegetables Caldin, Fish Recheado, Galinha Cafreal (Chicken in Coriander &Mint Sauce), Navratna Korma (a vegetable dish) etc. We also made a Creme Caramel for desert. We were given excellent instructions and direction. 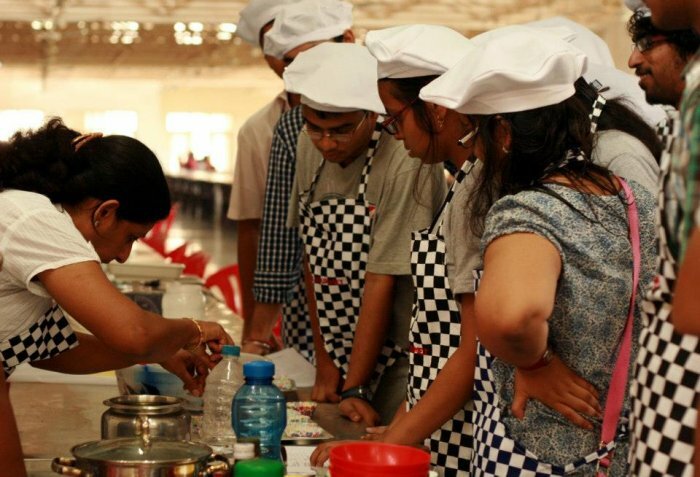 All the cooking was done by us (students), under the watchful eyes of Rita and her assistants. As the food was being taken into the house, and the table set, we spent some social time with Rita and her husband, Mukund. 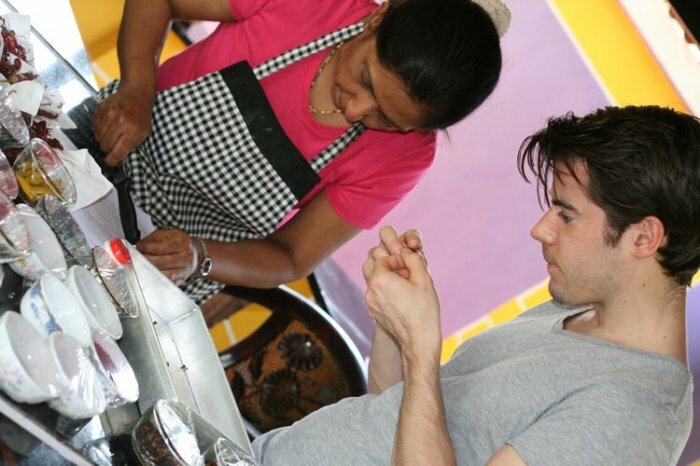 We spoke about cooking as well as life in India. Then time to eat what we prepared. Wow! This was so much better and different than Indian food that I had had in the US. I’ve become a fan. I will now go and try to cook different Indian food at home. My sister and I joined two others from our cruise ship for a fun day of cooking and shopping with Rita’s Gourmet. Rita arranged a pickup from our ship, took us on a shopping adventure through the local market, and guided us through creating 7 authentic and tasty dishes! Her hospitality was superb! We had the pleasure of meeting and chatting with Rita’s husband and daughter. It was a treat to spend time with such a special family. After two delicious meals (breakfast upon our arrival and the great lunch we prepared) we sadly said farewell. We were on a tight time schedule and Rita made sure we were back on our ship in time for its sailing. Rita followed up with an e-packet of recipes and photos in addition to the packet we received in our class. It was a fabulous experience!